When I think of disruptive, transformational technologies, I can’t help thinking about fire. Can any of us really imagine what life was like for early humans before fire compared to after fire? The understanding and mastery of this ‘technology’ transformed core aspects of everyday survival, from supplying warmth and protection to improving hunting and enabling cooking. That is the power of transformation through tools. Broadcast newsrooms struggling to ‘break out of the formula’ could take a lesson from fire. One way to accelerate change is to change your tools. I saw the transformational impact of new tools in my role as VP of Digital Content at TEGNA. Many broadcast news organizations at that time did not post fresh video to their websites until the end of the day, after the broadcast version of a story was ‘clipped. So we partnered with Videolicious, a mobile app which enabled reporters to quickly and easily create short digital videos while they were in the field working on their broadcast package. Likewise, we were looking for ways to use data to better answer the age-old question: “What is our audience talking about today?” We became an early adopter of CrowdTangle, and developed a method for using it daily for social listening and discovery that changed the conversations in our daily morning editorial meetings. What could be the ‘fire’ to kickstart your newsroom transformation? Here at the Knight-Cronkite News Lab at Arizona State University, we’re experimenting with several tools that might also help other newsrooms. For some important stories, social media is the first place – and sometimes the only place – where content appears. Public figures now routinely bypass media and ‘make news’ directly via social platforms. Likewise, breaking news commonly appears first on social media, with initial posts coming from everyday citizens rather than professional journalists. That’s why Cronkite News has partnered with Tagboard, a pioneer in social media curation and display. Tagboard enables our journalists to efficiently create social media narratives optimized for the broadcast screen, using the company’s curation, narrative and display capabilities. The Cronkite School is also experimenting with mobile storytelling and production. iOgrapher has provided Cronkite students with training and equipment to use their smartphones for mobile reporting. In conjunction with this training, the school has also been experimenting with Switcher Studio, which enables broadcasters to disconnect from the studio production booth. “Switcher Studio enables us to step out of our studio and produce a full show remotely, from anywhere, and all we need are a couple of iOS devices, a tripod and microphones,” said Brett Kurland, Director of Sports Programs at Cronkite News. Story tracking and story management is a challenge in many newsrooms. Here at Cronkite News, there is a mission-driven focus on telling deeper and more enterprise stories. Tracking story ideas and progress when most of your stories are not ‘day-turns’ can be a challenge. So the team has been experimenting with the ClickUp for tracking story pitches and development. “In a newsroom where multiple reporting teams are working concurrently, ClickUp has helped our teams — photo and video, social media, data visualization – to spot opportunities for collaboration and to jump into action,” said Lori Todd, Cronkite News Director of Digital Production. Many news organizations are looking for ways to connect more deeply with their communities and make news a conversation. 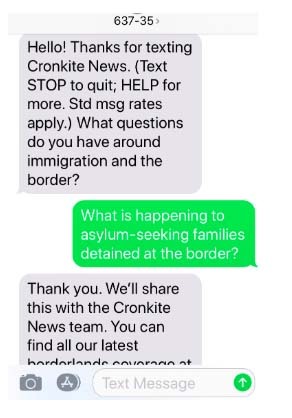 In collaboration with the ASU News Co/Lab, Cronkite News has been experimenting with Groundsource, a text-message audience engagement platform, to solicit story and content input from our audience and have text-based ‘conversations’ about the news that we use to inform our editorial decisions. Another partner, AlertMe, offers digital news consumers the chance to ‘follow’ and receive story-level alerts when a story is updated. 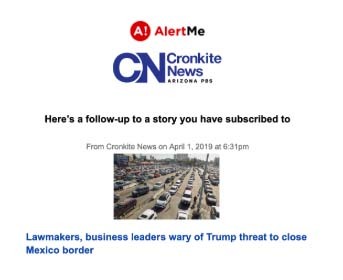 AlertMe enables visitors to www.cronkitenews.azpbs.org to personalize their experience and get AI-powered automated alerts when we do new reporting on stories they care about. 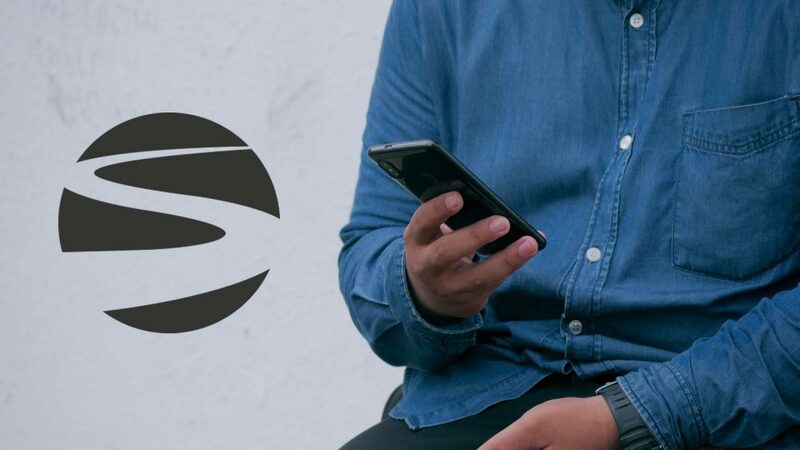 ASU Cronkite is also collaborating with SPROCKIT, a company that specializes in identifying start-ups with innovative technology and pairing them with corporate media partners. Whereas most commercial newsrooms simply don’t have time to try out lots of tools, the ‘teaching hospital’ design of the Cronkite newsroom enables us to test the most promising of these technologies in our news lab. Thanks to funding from the Knight Foundation, we’ll continue to share what we learn here at www.cronkitenewslab.com. The tools we use shape the journalism we produce. Whether your newsroom goal is to increase the inclusiveness of your reporting, innovate in story and show formats, or simply to develop more efficient workflows to free up reporters’ time for more enterprise content, there are tools that can accelerate news transformation. Time to start a fire. Examples from these and other collaborations will also be presented at the NAB Show in a panel on “The Future of News” on Sunday April 7 as part of the Digital Futures Exchange. 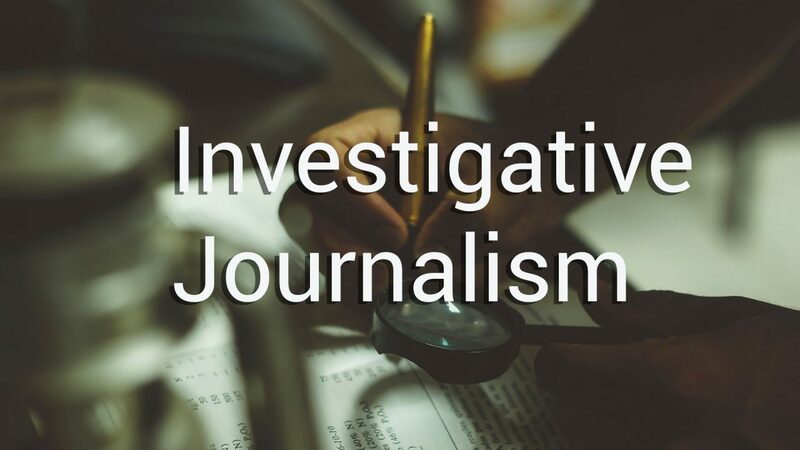 Andrew Heyward, Senior Researcher at the Cronkite News Lab, and Frank Mungeam, Knight Professor of Practice, will share best practice from the news industry and experiments from the Cronkite newsroom, along with other panelists.